Financial performance of top companies, frozen pastries growth rate, macroeconomic indicators such as GDP and population are some of the forecast factors that are included in Persistence Market Research’s recent publication titled “Frozen Pastries Market: Global Industry Analysis and Forecast 2016-2024.” This report offer an eight-year forecast for the global frozen pastries market during the period 2016 – 2024. The primary objective of the report is to offer insights on the advancements in the global frozen pastries market. The study demonstrates market dynamics that are expected to influence the current environment and future status of the global frozen pastries market over the forecast period. The report discusses how the overall competition in the market is steadily increasing and highlights various factors that are shaping internal as well as external competition in the market. Overall internal competition in the frozen pastries market is comparatively low due to a low number of major providers of frozen pastries products in the market. The global frozen pastries industry is facing external competition from producers and distributors of fresh pastries as well as from other providers of food preservation and dehydration techniques. Various barriers to entry in the industry are analyzed and rated on the basis of their impact on the competition levels in the market. The report provides information on the market share of the global frozen pastries market by its various segments. The report highlights the region-wise demand for frozen pastries and provides a market outlook for the projected period, setting the forecast within the context of the frozen pastries ecosystem, including new technological developments as well as product offerings in the global frozen pastries market. This study discusses key regional trends contributing to the growth of the frozen pastries market globally, as well as analyses the degree to which drivers are influencing the market in each region. This report on the performance of the global frozen pastries market begins with an overview of the market followed by key definitions and an executive summary that gives a 360 degree view of the revenue forecast of the global frozen pastries market. The market taxonomy segments the global frozen pastries market on the basis of product, distribution channel and region. The next section highlights the key market dynamics and presents an independent analysis of the various factors, challenges, and market trends that are likely to define the market in the next few years. The following sections quantify Persistence Market Research’s analysis of the global frozen pastries market by presenting data on the market size along with key performance metrics. In the final section of the report, a competitive landscape has been included to provide report audiences with a dashboard view. Key categories of providers covered in the report are frozen pastries suppliers and manufacturers. Detailed profiles of some of the leading market players are also included in the scope of the report to evaluate their long-term and short-term strategies, key offerings and recent developments in the global frozen pastries market. Yearly change in inflation rate has not been considered while forecasting market numbers. Top-down approach has been used to assess market numbers for each segment. Bottom-up approach has been used to counter-validate the segmental market numbers. Macro-economic indicators such as food industry outlook and food and health supplement spending have been considered to arrive at the indicated market numbers. The report not only conducts forecasts in terms of CAGR but also analyzes the market on the basis of key parameters such as year-on-year (Y-o-Y) growth to understand the predictability of the market and to identify the right opportunities across the global frozen pastries market. Also, another key feature of this report is the analysis of all key market segments in terms of absolute dollar. This is traditionally overlooked while forecasting the market. However, absolute dollar opportunity is critical in assessing the level of opportunity that a provider can look to achieve, as well as to identify potential resources from a sales and delivery perspective in the global frozen pastries market. By product type, Viennoiserie segment is projected to be the fastest-growing segment over the projected period. Plain & filled croissants sub-segment is anticipated to be the fastest-growing among Viennoiserie products over the predicted period, owing to the rising demand for frozen croissants from new markets and high consumption in traditional regions. The Viennoiserie segment accounts for approximately 60% value share in the global frozen pastries market. The segment was estimated to be valued at more than US$ 1,000 Mn by 2016 end and is expected to increase at a CAGR of 5.9% over the estimated period, to be valued at more than US$ 1,500 Mn by the end of 2024. Viennoiserie products have a long shelf life because of a particular substance that is used as food additive. Due to its long shelf life, online platforms are a viable sales and distribution channel for viennoiserie products and this is the precise reason behind the robust growth of this segment in the global frozen pastries market. Another factor creating a positive impact on the growth of viennoiserie products is the increasing demand for plain and filled croissants, Pain Au Chocolat, Pains aux raisins and savoury items from bakeries and restaurants. Owing to a busy schedule consumers prefer using ready-to-bake products and this range is gaining popularity amongst the working population globally. Viennoiserie products are ideal for consumers who have a busy and hectic lifestyle. Consistency in safety and taste is one of the important factors boosting the demand for Viennoiserie products in the global frozen pastries market. A large number of manufacturers are now focusing on offering Viennoiserie products that contain natural ingredients as preservatives as these enhance the shelf life of the products and are safe for consumption. The viennoiserie segment was estimated to be valued at more than US$ 300 Mn by 2016 end and is expected to increase at a CAGR of 5.9% over the projected period, to be valued at more than US$ 500 Mn by the end of 2024 in North America. The segment is estimated to create incremental $ opportunity of more than US$ 200 Mn between 2016 and 2024. Soft viennoiserie with innovative flavors such as dark chocolate and apple delight among others are gaining popularity among consumers in North America. The viennoiserie segment is expected to be a relatively attractive segment in the Latin America frozen pastries market during the forecast period. 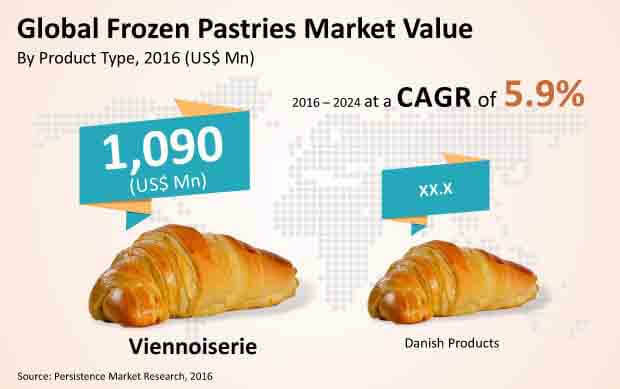 Adoption of effective marketing strategies such as the use of digital platforms, mobile applications, and social media platforms to increase sales of frozen pastry products are expected to drive the growth of the viennoiserie segment in the region. In Europe, leading companies are focusing on mergers and acquisitions in order to enhance their geographical presence and viennoiserie product offerings. The viennoiserie segment is anticipated to register a relatively high CAGR during the forecast period in the APAC region. Shifting consumer preference to frozen pastry products especially viennoiserie products is one of the major factors contributing to the growth of the global frozen pastries market. In the MEA region, increasing disposable income of the population is expected to improve the standard of living, thus enabling consumers to spend on luxury food items such as viennoiserie products, which in turn is expected to fuel the market demand for frozen pastries in the region.